Harnessing the Internet of Things for Global Development explores how sensors and the connectivity technologies associated with the Internet of Things (IoT), is improving development activities in research, policy formulation, service delivery and monitoring and evaluation across a range of different sectors including agriculture, sanitation, natural resource management, energy, and others. In densely occupied informal urban settlements, networked smoke and fire sensors placed in homes are able to signal and warn residents, and neighbors, of potential fast moving fires, saving lives and property. Sensors in development is still at a nascent level and the report acknowledges that there are many obstacles to widespread deployment, from technical challenges (e.g. reliability, power, connectivity) to policy issues (e.g. interoperability, security, privacy). 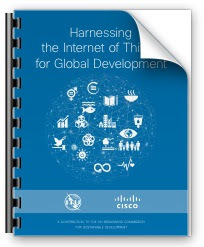 The authors hope however the report broadens the conversation on how ICTs, particularly the IoT, can play a positive role in development. FHI 360 and Cisco are organizing an event on January 29th in Washington, DC to take a critical look at the role of sensors and other Internet of Things devices and how they can be used to increase development outcomes. This half-day morning event will dive deep into current uses and future applications, with hands-on explorations of potential solutions for your programs.